In addition to my teaching a Shinshin Toitsu Aikido Kai Headquarters, I also serve as a part-time lecturer at Keio University. Over the course of different generations, older people have often complained “I just cannot understand the young people these days. They always do stupid things. ” However, of course there are also still many great young people. There was a young student who attended my classes about 10 years ago. He was interested in martial arts but seemed not to have the courage to enroll in a normal Dojo, but yet he took my Aikido classes. A year later I received a polite handwritten thank you letter from him about how impressed he was with the Aikido lessons and their usefulness in daily life. Even after he graduated from university, every year I constantly received a New Year’s card, a summer greeting card and a letter updating me about his life. This year, he started his own independent business. I’m thinking to support him as much as I can manage. By reflecting on it again, our relationship developed like this due to the careful and constant efforts by him. No matter how much you desire to build a relationship, there are sometimes relationships you cannot build or maintain. A relationship cannot be bought with money. A relationship must be developed very carefully. Humans tend to neglect things that are easily obtained. If you just meet someone in class, it doesn’t make you feel that it is a relationship. 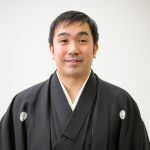 Even in this big world, the fact that I became a part-time Lecturer at Keio University, and that the young man enrolled into the University and took those Aikido classes, can be described as a big coincidence. If only somewhere or somehow something different had happened, the encounter would not have taken place. By thinking about it this way, you really appreciate relationships. Living in a self-centered way of thinking makes you consider the loss and gain by associating with people, and causes you to enter and cut relationships according to personal convenience. This can clearly not be considered as building up a relationship and there is also no collaboration obtained. In the case of this young man, I have heard that his parents taught him from a young age the importance of maintaining and developing relationships, which led him to continue to practice this even through adulthood when living apart from his parents. As it seems, he likes writing letters which is also a really wonderful habit. There is no doubt that there are many people other than me who want to collaborate with him. The foundation of this young man’s success has already been laid. The basis of building up relationships is that Ki is exchanging. For example, even sending a greeting card only once a year means that you have not forgotten the other person and the help you have received. On the other hand, there are families that see each other every day but do not exchange Ki. How can Ki be sent to the other person? There are various ways and writing letters is one example. Now, do you still exchange Ki with the people that have helped you once?